Identical to part # GAPCCCAR22420. Filter may be branded Carrier or Bryant depending on supply. Bryant GAPAAXBB MERV 15, Protect Your Home and Health: Eliminate Airborne Pollutants Bryant's ultra-reliable Perfect Air Purifier works to capture and kill dangerous bacteria, viruses and mold, safeguarding the air quality of your entire home. 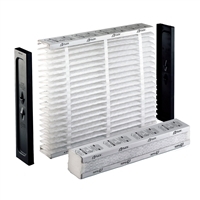 Indoor air is re-purified, not just filtered, as often as 8 times each hour.